Tim Cook is a clever guy. As the CEO of the largest tech company on Earth, he knows that investors, analysts, and consumers are going to parse every word that comes out of his mouth. That's why there's a good chance that he intentionally dropped the "this fall" comment on Apple's last conference call regarding upcoming product introductions. The market was quickly getting the idea that iPhones might be coming out as early as June or July, and Apple's rumor mill has put a dent in sales before as consumers hold off if they believe an upgrade is imminent. With those two words, Cook was able to realign expectations while remaining vague enough to technically maintain Apple's shroud of secrecy. The exec just bought Apple a couple more months before the end-of-cycle slowdown. Well played, Cook. There's more. With Apple's ambitious new capital return program, the vast majority of the increase was allocated to share repurchases as opposed to dividends. While income investors may have been waiting for Apple to boost its dividend payout (which it could have easily afforded), they may have to settle with "just" a 2.6% yield. This group of investors may have been sitting on the sidelines based on that expectation. By dedicating $50 billion of the $55 billion total increase to share repurchases while only boosting its dividend by an affordable 15%, Apple also gave itself a lot of financial flexibility in the future while capitalizing on its share weakness in a move that would inevitably accrete to earnings per share. If Apple had been too generous with its dividend increase, then investors would focus overly on future dividend growth. If there's one thing that investors absolutely hate, it's dividend reductions, which is why boosting its payout by more would put it on the hook for a long, indefinite, and increasing stream of future dividend payments. It would be an unsustainable precedent to set if Apple boosted its dividend by 50% just a year after initiation. Meanwhile, share repurchases are finite. Cook also teased "potential exciting new product categories" that Apple may enter. Entering new markets is typically very capital intensive. This is particularly true since Apple has already dramatically ramped up capital expenditures in recent years just in its existing businesses as it pursues ambitious new manufacturing processes. 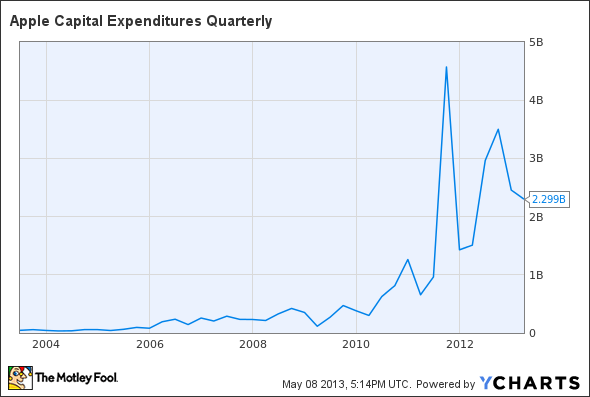 AAPL Capital Expenditures Quarterly data by YCharts. Specifically, entering the TV business is extremely capital intensive, and who knows what kind of envelopes Apple will push there with industrial design. Emphasizing repurchases instead of dividends gives Apple some wiggle room with how it spends its cash. These are just two other examples of how Apple just took control of the conversation. There's no doubt that Apple is at the center of technology's largest revolution ever, and that longtime shareholders have been handsomely rewarded with over 1,000% gains. However, there is a debate raging as to whether Apple remains a buy. The Motley Fool's senior technology analyst and managing bureau chief, Eric Bleeker, is prepared to fill you in on reasons to buy and reasons to sell Apple, and what opportunities are left for the company (and your portfolio) going forward. To get instant access to his latest thinking on Apple, simply click here now. The article How Apple Cleverly Reset Everyone's Expectations originally appeared on Fool.com. Fool contributor Evan Niu, CFA, owns shares of Apple. The Motley Fool recommends Apple. The Motley Fool owns shares of Apple. Try any of our Foolish newsletter services free for 30 days. We Fools may not all hold the same opinions, but we all believe that considering a diverse range of insights makes us better investors. The Motley Fool has a disclosure policy.